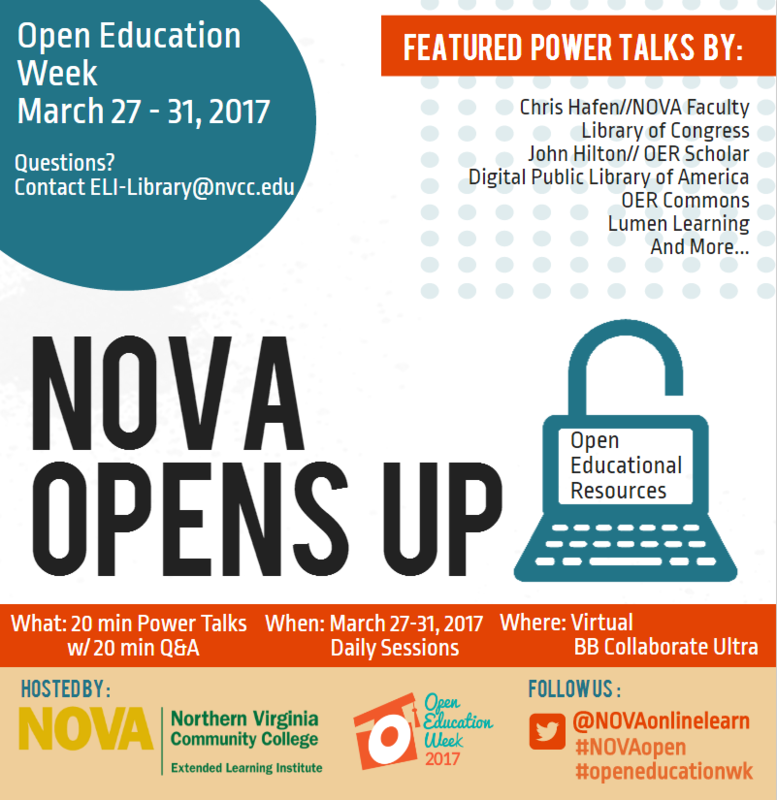 This guide is maintained by NOVA librarians to assist faculty with OER initiatives and sources to locate OER materials. If you have questions or comments, please contact ELI-Library@nvcc.edu..
OER initiatives and projects undertaken at NOVA will be highlighted, as well as data about student enrollment and success in digital OER courses. Participants will be asked to share their own experiences implementing OER at NOVA during the question and answer session following the presentation. Kim Grewe is the Acting Associate Director of Instructional Design and Development and an instructional designer for Northern Virginia Community College’s Extended Learning Institute. She is an educator, scholar, technology enthusiast, and a champion of Open Education. She was recently awarded an OER research fellowship through the Open Ed Group and is currently working on a PhD in Community College Leadership at Old Dominion University. Her dissertation topic is an OER efficacy study examining the impact of OER on student learning outcomes at NOVA. An overview of the University of Maryland University College’s model of institutional adoption and implementation of OER will provide a great opportunity for participants to compare and contrast to their own model. Stephen Miller is the Associate Vice Provost for the UMUC Library at UMUC, and also an Associate Professor in UMUC’s Graduate School and regularly teaches online. He holds a Master’s of Science in Library and Information Science from the University of Kentucky and a Master’s of Business Administration from UMUC. Prior to coming to UMUC in 2002, he was the Director of the Digital Library of Georgia at the University of Georgia Libraries, and previously an archivist and project manager at Duke University’s Rare Book, Manuscript, and Special Collections Library. Presenters from Teaching with Primary Sources, a program of the Library of Congress, will take you on a virtual tour of the remarkable digital resources from the world’s largest library. Cynthia Szwajkowski is the Assistant Director of Teaching with Primary Sources, Northern Virginia. Dr. Szwajkowski, who holds a Ph.D. in History has been with TPSNVA since 2011. She is a former Teaching American History Grant administrator, West Springfield High School department chair and has extensive experience working with teachers. Want to be convinced of the efficacy of OER? Hear distinguished scholar and BYU professor John Hilton talk about the COUP framework as an approach for studying the impact of OER in higher ed and designing your own research studies about the impact in your classroom or at your college. John Hilton has a Master’s degree from Harvard and a Ph.D from BYU, both in Education. John is the author or co-author of over fifty peer-reviewed articles and ten books. He has a variety of research interests including the processes of learning and teaching and the effect of Open Educational Resources. John and his wife Lani have six children. John loves being with his family, doing humanitarian work, learning Chinese, and performing magic. Looking for open online primary and secondary source materials to use in your courses? This session will demonstrate the searching capabilities and educational resources available from the Digital Public Library of America, a free, national digital library that provides access to millions of materials from libraries, archives, and museums across the US. Franky Abbott works as the Curation and Education Strategist for the Digital Public Library of America. In this capacity, she leads DPLA education initiatives with teachers and students in K-12 and higher education and curates and manages digital exhibitions. In this session, participants will learn about digital personalized learning platforms, including Lumen’s Waymaker. Learn about the ways in which technologies are being leveraged to customize the individual learning experience and enhance the communication between faculty and students. Paul Golisch is an Open Education Ambassador for Lumen Learning, helping colleges increase adoption of Open Educational Resources (OER). Prior to joining Lumen, Paul served in IT leadership positions for more than 20 years, with the last nine as a Dean and Chief Information Officer at Paradise Valley Community College in Phoenix. He also served as a tri-chair of the Maricopa Millions OER Project. He has presented at local, national, and international educational conferences on topics such as Open Educational Resources, Flipping the Classroom and Integrating Technology into Instruction. For the past five years, Golisch has also taught community college math courses using OER both online and in person. He received his B.S. in Mathematics from Valparaiso University and an M. Ed. in Instructional Technology from National-Louis University in Evanston, IL. Interested in finding high quality Open Education Resources to meet your course needs? This informational session will demonstrate the features and searching capabilities of OER Commons, the digital public library of OER. Melinda Boland brings over 15 years of experience in the educational technology and publishing space to ISKME and OER Commons. At ISKME, Melinda manages a team of project managers, information management professionals, and designers who together produce all of ISKME's OER products and services. How do I find OER? Do I need to covert my entire class to OER? Where do I start? This session will provide tips and tools for getting started with OER. With nearly 25 years of teaching in higher education, Lisa Young has encountered a number of instructional challenges that she has tackled by leveraging pedagogical and instructional practices and technologies. In 1997, she saw that retention in her water resources program was decreasing, she found that her student’s schedules were changing monthly because of the type of industry, so she offered courses for the program online. In the early 2000s she saw a need to have faculty share the wonderful resources they were creating and became involved in the reusable learning object movement, which has now evolved into open educational resources. Serving Scottsdale Community College as the Faculty Director of the Center for Teaching and Learning, Lisa's focus is in provides faculty development, consultation and programming to support strategic objectives related to improving student success in online learning, supporting faculty use of open educational resources, improving the developmental education experience through critical literacies, enhancing learning through co-curricular activities and accessibility. Currently Lisa serves on a committee for the Maricopa Community Colleges where she helps guide leadership in open educational resources. Lisa serves as co-chair for the Maricopa Millions Steering team, an OER district project where the goal is to save Maricopa Community College students $5 Million over 5 Years by radically decreasing student costs by offering low cost or no cost options for course materials. In just 3.5 years, the project has far surpassed this goal, saving students over $9 million. Chris Hafen of NOVA will present a summary of his path to developing OERs, the challenges and successes. The focus will be on the student uptake of materials and how they have impacted preparation, engagement, and interest throughout his courses. The session will provide lessons learned on avoiding pitfalls and building on strengths inherent in an OER approach. Christopher A. Hafen is an Assistant Professor of Psychology at Northern Virginia Community College and a Visiting Assistant Professor at the University of Virginia. He received his B.A. from San Jose State University in 2005, and his M.A. and Ph.D. from Florida Atlantic University. From 2010-2015, he was the project manager for the MyTeachingPartner project and currently works on The Connection Project in coordination with Joseph P. Allen at the University of Virginia. His research interests include understanding the function and development of close relationships in adolescence. His teaching areas are PSY 200 (Introduction to Psychology), PSY 211 (Research Methods), PSY 213 (Statistics for the Behavioral Sciences), and PSY 230 (Lifespan Development). Come to this informal session to wrap-up your thoughts and ideas after attending any of the NOVA Opens Up sessions. Ask questions, make comments, share ideas and experiences. Pop in and out of the session as your schedule allows. Dr. Wm. Preston Davis is Director of Instructional Services for NOVA ELI, and serves as Vice President of Partnerships and Executive Board member of the Community College Consortium for Open Educational Resources (CCCOER) and is a Steering Committee member of the WICHE Cooperative for Educational Technologies (WCET). Preston holds BS and MA degrees from Old Dominion University, and an Ed.D. in Educational Administration & Policy from The George Washington University.